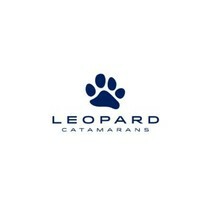 The Leopard Catamarans shipyard has been sharpening their expertise for 40 years alongside builders Robertson and Caine, catamaran architects Morelli & Melvin, and Simonis Voogd. As a result, they have expanded the boundaries of their design and have become pioneers with regards to the innovative approach and utmost aftermath. Their superior seaworthy yachts are composed of the finest perks one can dream of. The company grasped the very zenith of the nautical marked and has never let it go with the perpetual improvement, futuristic design, majestic layout, and livability. Their yachts have been given copious amounts of awards due to the unsurpassed standard with reference to the performance and seaworthiness. The Leopard 40 has definitely set new standards making leaving bystanders flabbergasted by the virtue of the craft’s layout and accompanying features that throw a curve wherever she goes. Unquestionably, she bears resemblance with her forerunners regarding agility, stability, speed and performance; however, some crucial improvements have been done with an increased volume in the hull resulting in more interior capacity. Let’s dig deeper into the Leopard 40 review. 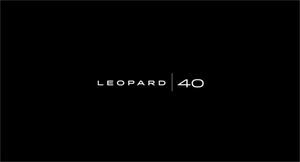 The overall length of the Leopard 40 is 39 feet and 4 inches while the beam is 22 feet and one inch. The draft is 4 feet and one inch, and at the same time, the displacement is 20.591 lbs. 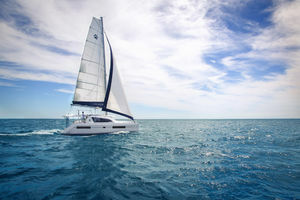 Reasonably, besides the engines, catamaran vessels depend on the wind as well. During the 7 knots breezes, she can gain approximately around 6 knots water speed at 70˚. Furthermore, during the seven-knot true wind at 45˚ she achieves excellent 5.5 knots water speed. If equipped with the twin 29 horsepower Yanmar, she can comfortably cruise at a speed of 7 knots (3000 rpm). These engines can even push her to an unbelievable 9 knots. Due to the superiority of her bow and the balance, she is maneuvered easily and performs quite well. The Leopard 40 price is nothing more than means to get a marvelous vessel such as this one. The cockpit of the Leopard 40 is quite spacious providing ample seating. It is covered with a full hardtop and quality lighting provided by LED lights. Lots of storage areas can be found here and it’s an excellent crossroad for the saloon and the helm. In the aft part of the cockpit, one can lower his dinghy with the press of a button. 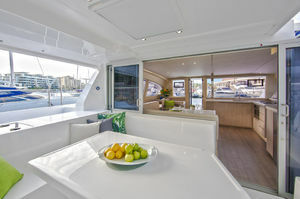 The cockpit is furnished with both large dinette to port and a lounge to starboard. This area can accommodate 8 people for dinner. Moreover, an immense sliding door leads to the saloon area. The dining settees in the saloon and the aforementioned cockpit dinette to port are back-to-back. 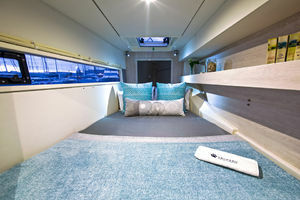 Therefore, one can invite even more guests for the party since the occupants who sit in the cockpit and the saloon can effortlessly strike conversations. 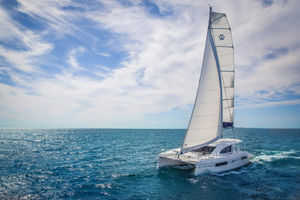 Since a lot of customers have their hearts on spacious areas, melting of indoor and outdoor living areas is certainly a "hole in one" for Leopard Catamarans. 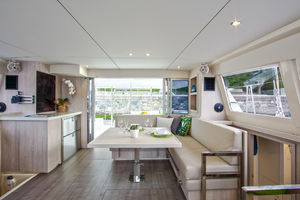 The saloon of the Leopard 40 is immensely spacious. The table of the dining settee can be lowered down and converted into a double bed. Significant storage space is hidden under the settee. The immense teardrop-shaped windows and rectangular side windows encircle the saloon and bathe it with natural light and enable panoramic views for the guests. The glistening and fresh design of the saloon attracts the passengers to spend their cruising time right here. A very boastful and spacious galley with panoramic views as well is located to starboard. It possesses Corian countertops and a lovely stainless steel sink (along with single lever mixer faucet with a pull-out spray). It doesn’t stop there since it also comprises Vitrifrigo drawers, a refrigerator, freezer, oven and a three-burner stove. 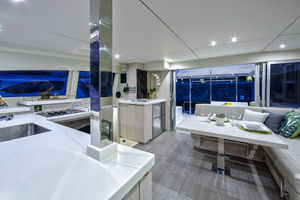 The galley provides storage areas in abundance. 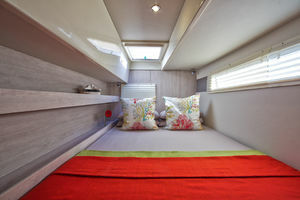 One can even find some storage space under the floor within the galley’s proximity. The luxuriousness of the galley surely dominates the area. Opposite the galley, to port, is a small working desk used as a nav desk. Coming back to the cockpit, only three steps divide the cockpit and the elevated helm station which is also covered with the hardtop. The helm station is to starboard and is incorporated within the cabin house. The skipper has a 360-degree view at the helm. 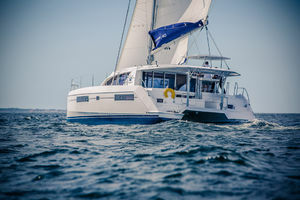 The helm enables effortless short-handed sailing and because of the proximity with the cockpit, the skipper is certainly not left out from the socializing aspect with the family and friends. The technical part of the helm includes various gauges. 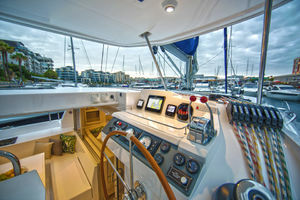 Further, the skipper has a compass, throttles, Raymarine display with countless functions at his disposal. All these gadgets are at his fingertips. Even a small counter is positioned in the center for putting different things like a mobile phone, for instance. 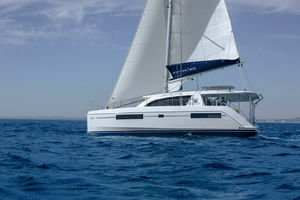 Cup holders signalize that all details have been included for a perfect voyage with the Leopard 40. Two control winches are led aft via eight conveniently adjusted rope clutches. 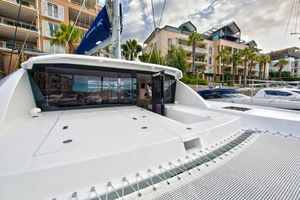 Stepping below deck to starboard of the Leopard 40, one encounters the owner’s cabin. Ample headroom and sliding door for privacy are just some of the cabin’s characteristics. 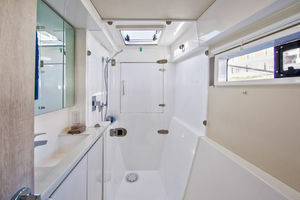 A well-proportioned berth is greeted by the natural light through the huge hull window. Optimization of space is done remarkably with the vanity design encompassing a wardrobe and a huge drawer unit. Two cabins can be found to port side of the craft. 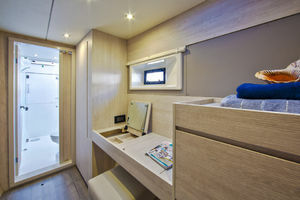 Aft cabin also provides plenty of headroom, a berth, a panoramic window, a full-size hanging locker and some drawers underneath the berth. The forward cabin also shares the same characteristics and traits as the one mentioned before. The Head is quite convenient with a shower, sink, storage space and a toilet. Moving from the saloon forward, one comes upon the midship where several storage areas are to be found alongside the windlass. The customization of the Leopard 40 is assuredly an option. One can choose different exterior and interior coloring and an endless list of options regarding features throughout the boat. 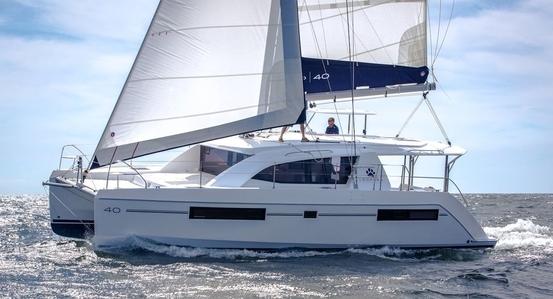 The Leopard 40 is the ultimate catamaran. She simply has it all – enviable performance, perfectly designed layout, multiple features throughout the vessel, comfort, safety and more. The stunning appearance also needs to be mentioned as well. So, get on board now and contact us for any information. Don’t let this opportunity slip away. Get your own Leopard 40 today!